This is a collection of the sources I have come across to date on this topic plus some of my own reflections. It’s a living document in the sense that I will continue to add to it. It started life in a private space for people from my master’s course at Ashridge and contains some personal information, so I’ve anonymised their comments. It’s now open for anyone else who’s interested. If you have input (your own or things you come across), let me know and I’ll add it. (I haven’t yet found a way of allowing the blog to be edited by multiple authors). Four of us from our Ashridge learning group had a discussion on the topic. We each shared our own experiences/feelings and reflected on how our various perspectives related and perhaps affected each other. The first following section is my notes on the call, which the others have approved. After that there are some sections with individual comments or exchanges from these and some other folks. We had different but overlapping perspectives on what constitutes home/homecoming/coming home. ST, for example, saw home as a physical, private space but not just bricks and mortar. Home involves people and memories. The emotions associated with home have to do with the people that live and have lived there, that have in one way or another contributed to it being the place it is. Where she lives now is the home she made with her son. She said that a public/shared place didn’t constitute home for her (I wondered whether she might see it differently if she were living in a friendlier environment). For JM and me, home had multiple possible locations – it could be a house (therefore private), but also a neighbourhood (shared), a region, a country. Home can be in multiple locations in parallel – depending only on where you are at any one time. For JM, the “home” that is the house one lives in, is a movable feast. If he moves, “home” moves with him. I think that JB echoed that. This seems to me consistent with ST’s comments about the role of people in “home” but perhaps less with memories and associated emotions. The extent to which home is portable, however, would seem to be dependent on whether the people move with you. I’m very fond of my house in Amsterdam, where I’ve lived for more than 20 years. But my feeling of “coming home” is much stronger for my neighbourhood than for my house as such. One of us observed that home is the place one can be oneself, be free to wear and do whatever one wants without being concerned what anyone else thinks. That certainly fits with what ST called a place of safety and comfort. JB has lived most of her life in the same small geographical area and only in three houses there. She wondered whether she’d maybe missed anything by not having sampled living abroad. ST moved to Paris when she was 20 and stayed there 7 years – would probably have stayed or moved back there, if other parts of her life had worked out differently. Lebanon/Beirut doesn’t really feel like home (even though her house does). I moved abroad because I’d always wanted to see what it was like to live in another country (as opposed to just being there on holiday). That it was Holland was more or less an accident and that I’m still there is partly habit, partly raising a child here and partly meeting my current partner (although I suspect she might have long ago moved to another country, if she hadn’t met me – funny old world!). JM (and JB’s husband too) moved in search of opportunity. JM knows a lot of folks back in South Africa but also some Americans, who never considered living anywhere other than where they grew up and seem very happy about it. I suggested that while home is a factor in one’s identity (a point made by ST), one’s identity – the sort of person one is – may equally determine one’s attitude to staying or leaving. JB remarked that, when she’s at her mum’s house, which is behind (or very close to) the house she grew up in, she experiences a feeling of home, because of the birdsong she remembers from childhood and is still to be heard there and because of a particular tree. This connected for me with my reactions to particular musics and to particular landscapes. She wrote later: “I remember JM talking about the home feeling he has when arriving at a South African airport, made me think that I have this same feeling when arriving at a French airport (so not only my apartment). It’s not only a feeling but a smell that tells me it’s home. Could be a geographic area, a country or a city/village. Often, a place of birth and origins. Or a domicile, a residence, an accommodation where we stay. A place that provides facilities to sleep, eat, wash. I think, it is not transitory, but more permanent and stable location. Since it’s more or less permanent, you accumulate things, and your possessions and personal belongings (memories attached to them) can tell your life story. Home is close to the heart, it could become a possession (For me, buying a house is a life project, more than just an investment). It’s a physical place you always return to. The concept of home, it’s a feeling, not a place. Home is with occupants, without occupants it is a house or an apartment or anything else. Most common, the first home goes back to childhood, with family. In this case, home is a memory keeper. It is where you felt loved, listened to, where your dreams were encouraged…etc. It’s also a place you love and cherish. It brings a feeling of comfort, welcome, safety, stability. A kind of an emotional landmark. Home could be seen as haven and a refuge, where you can retreat and relax. It’s private and away from public. It’s for the individual or shared with selected and close people (family, partners, friends). Saying this, I notice a duality: inside/outside, work/home, public/ private, comfortable/uncomfortable, safe/unsafe. It is certainly influenced by the fact that I grew up in a war zone (and also a hostile environment with little consideration to human/women’s rights) and lived threats and displacements: war/peace, shelter/exposure?? It is also a place to experience our inner self, with a temporary detachment from our public persona. A place or a space where we expose who we really are, our authentic self. Home could play a role into who you are, used to be or might become. Therefore, home = identity. There must be a reason why it is added to the ID and some legal and administrative forms, in addition to nationality and where you live: BORN in XYZ. Could a person have several places they call home? 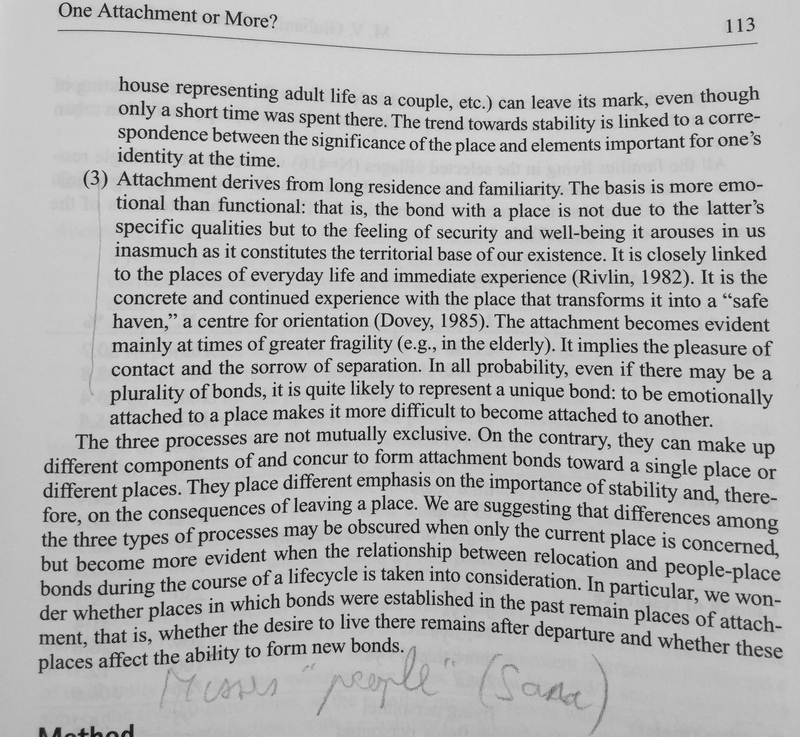 Is home a place of current residence? Home is so familiar. Can the meaning of home also be a place that we can never see as a stranger? What is the relation between home and authenticity? How is the concept of home connected with our identity? How can we create a feeling of being at home anywhere in the world? Wrote later: “ST talks about dropping one’s social veneer when at home. For me, that is an important factor that boosts my creative energy. Home is a place where I am able to express myself creatively. I’d also like to emphasize the points made about the “feeling” of home. Something deep in the gut that goes way beyond the analytical / rational self. I am curious to the way the term home is used in family conversations. Even though my sons and nephews live on their own, they still refer to their family residence as “home”. We still out of habit refer to South Africa as “home” although that is slowly changing. “I apologise that I am just a poor working girl with dirt under her fingernails” She makes this reference a lot. What does her life growing up on a farm mean for “home” now? Is there any relationship to my partner’s recollections below? In an as yet unfinished conversation, I asked him: “You set all these things in the context of family and tradition. Is that a determining factor in what represents home? Could we say that was a non-material definition or is physical place always relevant – for you? Are there other non-material things that feel like ‘home’ – music, sounds, smells, literature?If I remember aright, you said you’d more or less accepted you’d never live in County Clare again (presumably because it doesn’t fit with what you and your partner are doing with your lives). Does that bother you? I lived in a little apartment during my 5 years working in Dusseldorf. There was nothing special about the place and I used to go home (Amsterdam) every weekend but when I finally left Dusseldorf for good, I had a lump in my throat about leaving that little apartment. Somehow I had built up a little life there and the place apparently had become part of me. In the mail to BC I noted “I’ve lived abroad for 30 years. I always said I didn’t rule out moving back but I find it increasingly difficult to imagine doing so. Does it bother me? Not really. When she lived in Amsterdam, the feel of the wind and the fresh scent of the air as she crossed the river (the river is, at that point, right on the edge of the city), had that coming home feeling. The way she talked about her house (and its garden), in which pretty much everything apart from the walls she’d done herself, as well as the feeling of belonging (in a private space), reminded me very much of what ST in particular had said. Now she is back where she grew up and I’m living there too. For her the “court” (from the French for a courtyard) is home. It’s a little area between the older buildings from her father’s business (once a brewery and then a drinks wholesaler). Memories of her father appearing out of the “crate room” and going to the “brewery” – later the office as well as the garage for the lorry. She remembers the high writing table where her father used to write up his records. Most of the plants she brought with her from Amsterdam are now in the court – another sort of home, a reminder of a place she put together largely herself and lived happily in for many years – a feeling like Sana’s of somewhere safe, private comfortable – where you can be yourself. We talked more about her comment noted in my Project Report, that listening to African music (particularly live) feels like coming home. It feels for her as if she had lived in Africa in a previous life. She also remarked on how South and Central Americans in New York brought home with them in the form of music and how these homes merged and mixed to create the style now known as Salsa. “Een café is een variant op wonen. Een variant op jezelf thuisvoelen.” Dit zei broeder Benedict van Westmalle. A piece by a columnist in De Volkskrant on rain as home. I shall translate at some point. “We zijn niet altijd even goede vrienden, de regen en ik. Ik klaag vaak over hem, als de dagen koud en somber zijn. Als de buien blijven hangen over je dag, blijven zeuren aan je humeur. Als iedereen erover klaagt. Maar als ik ver weg ben, in een land waar hij zelden komt, waar regen altijd een zegen is, en hij klettert naar beneden, dan komt de waardering terug. Als de druppels zachtjes landen in een warm land op het warme zand dat met een dun laagje de straten streelt. Die zoen tussen de regen en het zand, de geur van de modder. Als ik de regen elders ruik, brengt het me altijd naar thuis. Naar hier. Die gedachte probeerde ik te koesteren toen ik vanmorgen naar een afspraak liep zonder paraplu. Het was oké, de regen. Het was mooi. Hij waste mijn haren, mijn jas raakte doorweekt. Het bracht me terug naar herinneringen aan eerdere intense buien. Toen ik zes was en het tijdens de avondvierdaagse zo hard regende dat ik tot aan mijn sokken toe verzopen was. Toen ik negen was en ik dacht dat als de regen niet zou stoppen, Almere weer een meer zou worden. Toen ik dertien was en de stortbui door de straten danste, samen met de wind die een boom op mijn vaders auto smeet terwijl mijn zusje ter wereld kwam. Toen ik achttien was en we een film maakten met Frits Lambrechts als stem van de herfst en van het water dat uit de hemel viel. De brandweermannen maakten die regen met twee wagens tegelijk. Toen ik vierentwintig was en van mijn eerste verkochte script een parfum aanschafte dat iets als ‘een tuin na de regen’ heette. Toen ik zesentwintig was en het hoosde in de woestijn waar ik kampeerde. Toen ik dertig was, verslagen terug van wilde jaren buitenland. En de regen maar bleef komen. Ik had geen geld voor de tram, want ik moest helemaal opnieuw beginnen. Maar het was oké. Ik had de Hollandse buien gemist. Het was een warm welkom. This document, by Misha Myers, discusses a project where refugees and asylum seekers in Plymouth were asked to draw a map showing the route from home (the home they came from) to a “special place” and then cast that on a map of Plymouth. They then walked the route and described what they were seeing (in the memories and now) and what that meant to them. This is a fascinating project and I need to get round to writing it up properly. A book I read recently. Focus is on urban design but “home” crops up a lot. “The environmental setting is not a neutral and value free space; it is culture bound. Individuals’ perceptions and their evaluation of the environment change over time and are influenced by the history of a place.” This includes “Urban ways of living, environmental needs, local involvement and the search for identity, as well as pro-environmental attitudes and behaviours”. “one can assume that people who appropriate their environment and feel at home where they live, will also care more about the environment in general”. Which is of course my fundamental thesis but one might wonder why one can assume this. Plus appropriate is a dodgy word. People were asked to choose their significant places in their neighbourhood and to provide their motivation. Interesting that encountering the place, a landmark and contact with nature were by far the most common motivations. Unsurprisingly then Green Areas (followed by church and home) were far and away the most common choice of place. Longer term residents of older neighbourhoods had more emotional attachment to the area than younger resident, for whom “social-interpersonal” was more significant. Does a feeling of home perhaps develop out of the strength of the latter? Kaplan and Kaplan (1982) suggest that “sufficient levels of complexity and mystery….are necessary for providing people with new opportunities to assign meanings to the environment” and therefore maintain their sense of involvement. Does this apply to the natural environment as well? What does that mean for parks? “….memory will then form a construct in the mind that is consistent with the meaning that we give to the narrative” and therefore culturally bound – or at least influenced. “become more ingrained in our reminiscences of the urban experience when reinforced by the consistentcy of the manner in which we remember”. Quoting Bergson (L’Evolution Creatrice via Fry (1996)) “With the passge of time an observer accumulates in in his memory a strore of perceptual information about a given object in the external visible world, and this accumulated experience becomes the basis for the observer’s conceptual knowledge of that object”. So memories of home are modified by a narrative of experiences, which are modified by culture and time. See also section on Cromford Court in Manchester and observations by Burgin (1996) – also bringing in Benjamin – how the flaneur turns “the boulevard into an interior”. Here we also see how imagination and personal experiences and tastes (culture) can create imagined recollections in terms of special relationships or even what was or was not on a given street. Hellevoet (1992) “this theory…posits urban space as a playground where everyone interacts and which everyone mentally recreates and constantly transforms. One participates in creating the urban environment as one discovers and constructs it”. 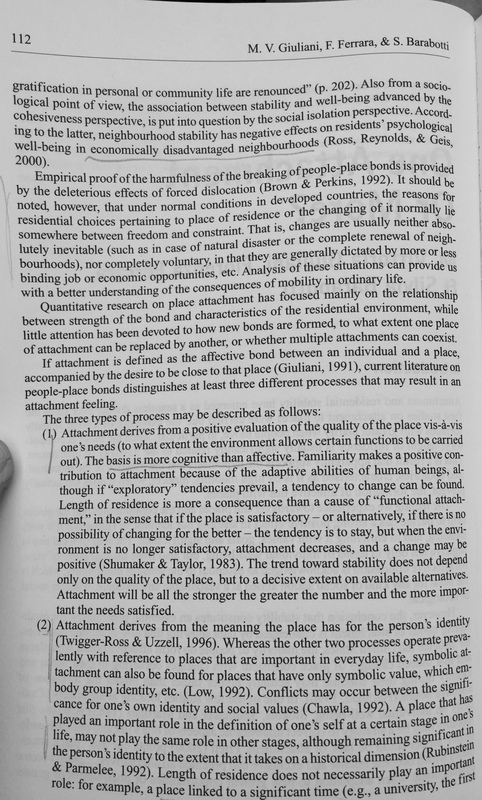 Argues that the tendency is for community to break down in urban situations due partly to increased personal freedom (from social control) – or that people actively seek escape from such communities (urban working class, immigrant). “..both rural and urban communities have been seen as restrictive and limiting environments, from which those with aspirations for social mobility and personal development try to escape.” (cf Jay’s observations). So community can work against a sense of home. “the common factor (in local activism) is no longer intrinsic but contingent”. My own experience is different. Stacey (1960) “concluded that, while the ‘traditional community’ has little relevance in modern society, many people retain considerable links to local social systems. Where the traditional community was born out of necessity, providing mutual support in adversity, this modern form of community is partial and elective, an aspect of the social freedom offered by the city.” Which somewhat contradicts the first two paragraphs. I found the first few pages of this article so useful that there seemed no point extracting a few quotes. The study they carried out to test these ideas was rather limited in scope. I found nothing additional to report in the results, although they generally support what is said above. This is about the role that food plays in bringing a sense of “home” into an immigrant community. They trace (making use of previous studies and theoretical frameworks) how, as the immigrant community becomes increasingly assimilated into the host culture, the food culture becomes appropriated into the host culture – as exotica or as fusion. It’s a well thought through and interesting article but told me surprisingly little of relevance to “home” than what I just reported. I found it a little unfair on the reaction of host natives. Where I lived in East London, the presence of multiple ethnic food sources – from the Bangladeshi restaurants (cafes really) on Brick Lane and the all night bagel shop further up the street, to the Caribbean, African and Jewish market stalls and shops on Ridley Road – served to give the area a feeling, for us, of home – somewhere we actually lived. That was of course 30 odd years ago and it’s all gone a bit up market since then but my impression is that the newer incomers, of the age we were then, feel the same way. It’s not the fusion restaurants and trendy bars that attract them. This sounds kind of boring but was for me one of the most thought provoking articles in the book. It comes out of an international research programme on “home based enterprise” (HBE – aka home-working, centres of production in the home). The authors carried out their project in a kampung in Surabaya, Java. The range of home industry is (for me) surprisingly broad, from catering to shoes and textiles, dying and even mask making. Some production is consumed in the kampung itself, some is international. Some homes have separate spaces for production. Others have to be cleared every morning and in the evening returned to their state as a living space. In the latter case, cleaning is also very important, because most people are Moslem and places of prayer must be completely clean. Some people collaborate in a workspace. This has cultural implications because there is then a dependency and debt (not financial). The kampung, although quite large, is a tight community with lots of extended families. Houses are located on alleys and much activity takes places outdoors. Weddings and funerals are major events which create both expectations and business for local enterprises. It’s a fascinating article, which I could have quoted more extensively and is certainly well worth anyone’s time reading. There are more examples (generally positive) of blurred lines between business and private, between client and guest. Identity also gets attention. Both work (occupation) and home are usually determinants of identity but separate. Here, where the two share space, there is mutual reinforcement. I wonder whether that is always positive. 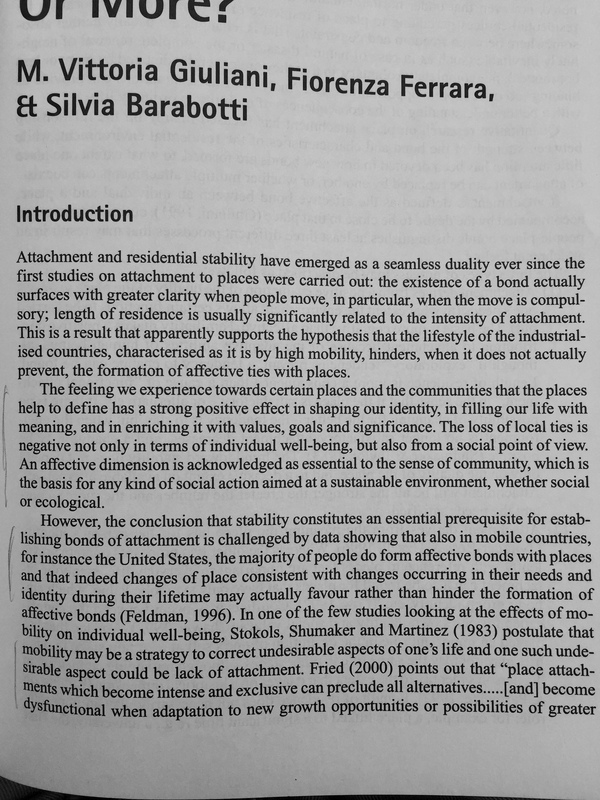 This paper and the next one were my introduction to a debate in feminist circles about home. Well, sort of about home. The discussion seems actually to be much broader – about women’s identity, about politics and how to intervene in it, about co-existing in non-consensual environments and much more. Honig cites sources from women philosophers, sociologists, psychologists and educators and puts these in the context of a debate with some white, male liberal philosophers – in particular about “dilemmas” – whether these are things to be settled, reduced to a single thread or to be embraced as twin realities (these are all my words, not hers). Where home comes in seems to work as follows. Most writers seem to agree that “home” (whatever it is) is formative for identity. The idea that “a woman’s place is in the home” (looking after the kids, making sure hubby’s dinner is on the table when he gets home), which is depressingly still common in many societies, arguably makes home a constraint on identity. A nuance is that (some? many?) women see home as the domain where they are in charge, where they make the decisions, as their “castle” and where they consequently are appreciated and safe. Either way, feminists (all? most?) have tended to reject this kind of home and sought a different kind of home amongst like minded women. And therefore safety and comfort was to be found in that environment. Except that, following Honig and her sources, they then discover that there are many differences that are uncomfortable (e.g. is a group of middle class, white women a source of comfort for working class black women?) or the lack of acceptance of difference (an insistence that there is a single ubiquitous woman’s experience – that being, for example, lesbian doesn’t change anything). In short and without doing proper justice to the argument, this unrealistic consensus creates a new kind of home, which is again imprisoning or utopian. Far better is the acceptance of dilemma and conflict – of an edgy, un-comfortable existence, one which requires the abandonment of the whole concept of home as a place of safety and comfort. “From such a position of resistance and agency, from a position that resists the seductions of home, we are empowered to ask after and to theorize the possible connections between home and elsewhere” (after de Lauretis (1990)). ?re-read – does it add anything? Weir uses her tribute to Young to argue with Honig (and others). She also cites Reagon (from the same book Honig refers to): “The only way you can take yourself seriously is if you can throw yourself into the next period beyond your little meager human-body-mouth-talking all the time. . . . You must believe that believing in human beings in balance with the environment and the universe is a good thing”. Weir concludes from this “With these words, Reagon holds out for us the dream of a better home, which we can create only by expanding ourselves to embrace connection.” All of which is a nice connection to my assertion that home can be a key to sustainability. Young apparently extended the discussion to the rights of the elderly and the importance an own “home” plays therein. That’s probably enough to give the gist of the argument. In the end I’m not sure there’s such a great distinction between the conclusions Honig ends with and those of Weir. I guess I tend to Weir’s position but, as a white, male, hetero I’m happy to take this input as new knowledge based on insights and experience I can’t have – and a serious warning not to reach easy conclusions on the value of “home”. That said, what I’m looking for in this investigation isn’t to be reduced to an idealised yearning for a place of safety and comfort. It’s closer to the Willett/Douglas approach (which I think also applies to bel hooks but have to read the original). And I hope that Beatrice Reagon’s “believing in human beings in balance with the environment and the universe is a good thing” will also prove relevant. There are broadly speaking three categories of homelessness. They are not necessarily mutually exclusive. The first is the classic sense of being without one’s own domicile, sleeping on the streets, short term hostels etc. Anne Kidd (see below) writes extensively about her work with the homeless, what home means (or does not) to them and how that has affected her own sense of home. The second category is the refugee: someone for whom it is not safe to return to her home – for reasons of politics or natural disasters of national scope. The “home”, which is no longer available, has in this case a wide geographical range even if the person’s concept of home is itself very local. The third category is people for whom home no longer exists. That could be the result of war or natural disaster – the home (whether a building, a village or a whole district) has been destroyed or made uninhabitable. This is really a special case of the refugee. But we can also have a situation where the physical home still exists and there is nothing to prevent the person from living there. In fact they may well live there but whatever may have made it feel like home has disappeared. This merits a bit more depth. Much of Dawson and Rapport (see below) addresses this. It’s also the case for some of the contributors to this document. AB, for example, no longer feels at home when returning to her home country. This comes to some extent because she has changed and to some extent because people treat her as if she had changed. She has changed due to her travels, her education and new interests. She can’t locate this in the home country. People who still live there think this means she has abandoned her “own” culture or has become “too good” for it. That “home” has become a nostalgic yearning for something that is no longer available to her. At the same time she hasn’t acquired a feeling of home where she now lives and works. It’s not a chosen adopted country – just where her work is. And the virtual home that can exist via like-minded groups of people is also unavailable (other than perhaps in the digital world), because she find herself caught between two disciplines, each of which regards her as belonging to the other. GG is currently rediscovering home somewhere in the space between places she used to live, where she officially lives now (but is not culturally at home) and somewhere she sometimes lives. Her situation is, I think, akin to some of what is discussed in Dawson and Rapport – people who have chosen or found themselves (trapped) in lives of constant migration. JF, sharing with me a feeling of home as exactly that – a feeling which can be experienced in many places and contexts. So an example of a migrant, who is not homeless. In her case discovering that feeling in a barren climate, because it shared the feeling of wilderness known to her from her youth, whereas where she has lived for the last few years is more densely populated and fails to awaken that feeling. Recently finished. Comments to come. Dawson, A. & Rapport, N. (1998). Migrants of Identity. Bloomsbury. Just finished. Comments to come. Jackson, M. (2000). At Home in the World. Duke University Press. « Get up and dance!